A beautiful run of six antique porcelain apothecary jars. 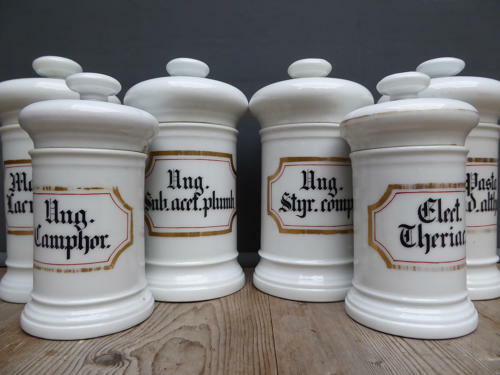 A fabulous run of glazed white chemist jars, four larger & two smaller, all with their original removable lids. Adorned with painted preparation labels featuring neat black caligraphy and gilt & red detailing. The base of each jar is stamped & signed & they display beautifully together. Wear commensurate with age with some light chipping to the undersides of the lids & rims cosistent with use. One of the lids of the smaller jars has some more notable damage & an early reinforcement to the underside (see last image). This is very much part of its past, can be displayed out of sight & does not detract from a wonderful set of jars.